Nylon attached eye wide slings are popular for delicate, lighter duty load applications where additional width is needed for load stability. 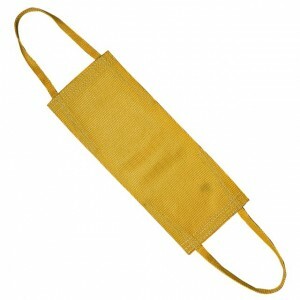 Intended for basket hitch lifting, cargo patch eye slings have a wide nylon webbed body. Eyes are attached and constructed of 1” or 2” webbing. The narrow eyes accommodate small hooks well. Made in the USA, CORE™ Nylon Attached Eye Wide Slings feature heavy duty webbing that is treated for added abrasion resistance. CORE™ Nylon Lifting Slings have a heat-imprinted sewn-on tag and meet or exceed all present OSHA and ASME B30.9 standards. 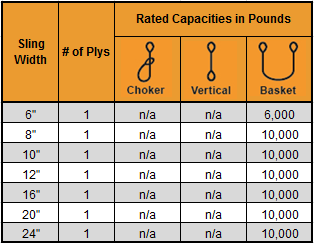 Nylon attached eye wide slings are offered in various rating capacities. Call our experienced lifting team at 888-794-0587 Monday - Friday, 7am-5pm CDT to find the best nylon lifting sling for your needs. If you need a stronger wide body lifting sling for heavy duty loads, CORE™ Industrial Slings also offers a Continuous Eye Wide Sling.